Pokemon, Power Rangers, Zelda, Mario… these are characters that I grew up with & are now making a resurgence & being marketed to my children. Power Rangers toys are everywhere in stores, Pokemon Go has taken the world by storm, Nintendo is releasing a new Zelda game with its new console, & Mario Maker was a big hit. Reusing these characters is a very effective marketing strategy, & it is something that brands outside of the entertainment industry should be using more often. The kids beg for the toys; the parents have to fork over the money – it’s just the way things work. A lot of brands try to market just to the kids in the hope that they will beg for it long enough for their parents to break down & get it for them. The genius of nostalgia marketing is that the parents actually want to buy that toy too. Parents love sharing a piece of their own childhood with their children, & the buying process becomes much more emotional. The buying process is always driven by emotion so when you can tap into nostalgia, your job becomes a lot easier. When you are selling a nostalgic product, the parents actually want to buy that product for their children (& themselves), & their kids barely have to ask. The parents now have the money to buy the things that they always coveted as a child, which is why they will buy silly games like Mouse Trap & Cross Fire since their parents never let them have it. Something that has truly surprised me is the rise of 8 bit video games. We have the technology to make video games look more realistic than ever, yet players are choosing to go back to the pixelated style of their childhood. Endless Mario Maker levels are being created in 8 bit worlds, & Nintendo NES has been updated & re-released. Even Vans has come out with a limited line of shoes that display 8 bit characters. This shows us that nostalgia is more powerful than aesthetics in many situations. There are many successful Etsy shops that have used nostalgia to their advantage as well. Parents will buy adorable onesies with references to their own childhood like this Brave Little Toaster reference, or birthday cards with troll dolls on them just because it brings a smile to their face. Nostalgia ignites something within us that connects us with our inner child, which is always a welcome feeling. Of course, there is a right & a wrong way to use nostalgia. You want to connect with your customers in a genuine way. You want to bond over a shared past & understand what is nostalgic & meaningful to them. It is more than simply re-releasing an old product; you need to update it & modernize it without losing the nostalgic draw. This is much easier said than done, but when you get it right, it pays off. 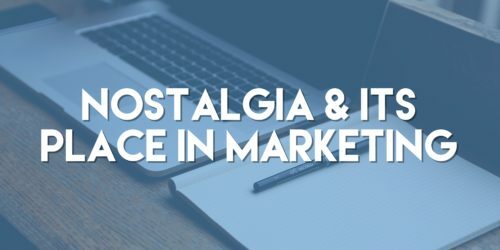 Take the time to brainstorm how you can use nostalgia within your company. What fond memories can you tap into? What shared past can you share with your customers? What did you love as a child?